Practice owners need to be fairly compensated. A four-tier formula is the answer. If you are an owner spending a fair amount of time on management, you might allocate 1 percent of gross to yourself for management duties. As the owner of your veterinary practice, how do you determine your compensation and benefits? Unfortunately, many practice owners are what I call bottom feeders. That is, whatever amount is left in the bank account at the end of the month is how much they pay themselves. This is not how you should determine your compensation. It is not fair to you, the owner, and you might be kidding yourself as to your practice’s financial success (or lack thereof). Compensation for management if the owner spends time managing his or her practice. Like an associate veterinarian, owners should pay themselves a percentage of their production. Production is defined as fees generated and collected for services the doctor is formally involved in the delivery of. Therefore, the owner must be formally involved in a service to receive credit for it. The percentage paid to the owner would be similar to what an associate receives. Normally, an owner would get 18 to 25 percent of his or her production, depending on the benefit package. The higher the cost of benefits provided, the lower the percentage paid. The total package of salary and benefits should not exceed 25 percent of the owner’s production. The percentage is especially important in partnerships, where one owner might receive greater benefits or one partner might work more hours. The 25 percent cap includes production, salary, health insurance, dues, license fees and continuing education. As a practice owner, you should receive a return on your investment. You need to be compensated for all the blood, sweat and tears that went into and continues to go into your ownership. Unfortunately, many owners pay themselves less than what they pay their associates, which is not acceptable. Return on investment refers to the value of your veterinary practice, corporation or working entity — that is, not the land, just the practice itself. In other words, if you were to sell the practice, what would the price be? As an owner, you should get a return on that investment. The normal ROI is prime or prime plus 1 percent. Prime is the best interest rate that banks offer. If you were to Google “prime interest rate,” you might find that it sits somewhere around 5.5 percent. So, for example, if your practice is valued at $2 million, you should get an ROI of $110,000 a year. This would normally be paid out in monthly installments. In S corporations, it is normally paid as an S corporation distribution. You would be paid $9,166.66 a month as your return on investment. Hopefully once you pay yourself a fair production and return on investment, some money should be left over, which we will call net profit. If you are a single owner, you could reinvest the money into your practice and maybe purchase a new piece of equipment, or you could set the money aside for future expansion. As a partner, you can decide whether the money is to be paid to the individual partners or retained in the business. If the money is paid out, the act is normally accomplished in one of two ways: based on the percentage of ownership of each partner, or based on the production of each partner relative to each other. This would be decided by the partnership and stated in each partner’s employment agreement. If you are the owner of your practice and spend time managing it, you should get paid for the responsibility. The cost to manage one’s practice is normally budgeted at 3 to 4 percent of practice gross. Therefore, if your practice grossed $2 million a year, your available funds for management would be $80,000 at 4 percent of gross. This is your entire budget for management, so if you have a practice manager, office manager or anyone else who spends time doing management, their compensation needs to come out of the budgeted amount. If you are an owner spending a fair amount of time on management, you might allocate 1 percent of gross to yourself for management duties. If you manage the entire practice by yourself — I don’t recommend it — you would be entitled to 3 to 4 percent of the practice gross for those activities. As a sole owner, you should be able to pay yourself production, ROI and management compensation (if you are managing), and some money should be left over at year’s end for a division of the net profit. If you can’t do this, maybe your practice is not as healthy as you think. Many owners fool themselves into believing their practice is profitable when they actually underpaid themselves in one way or another. Maybe they failed to take fair compensation for rent when they own the practice building, or maybe they didn’t pay themselves for their management time. 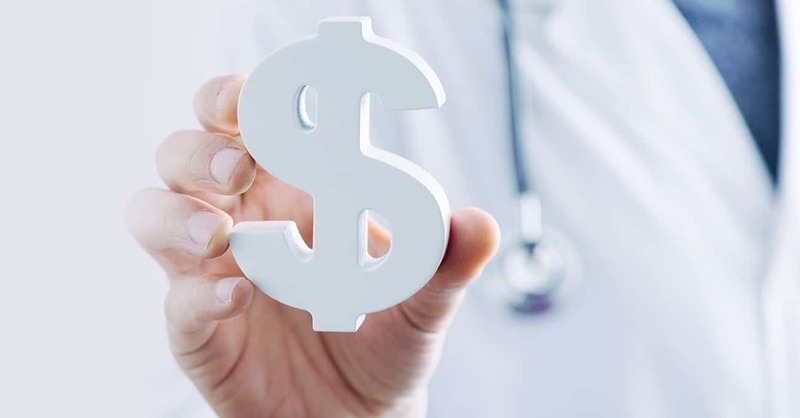 The bottom line is, if you are not able to pay yourself fair compensation based on this formula, then your practice is not as profitable as you might think. You should set your compensation based on the formula and pay yourself accordingly. Don’t wait to see what is left over at the end of the month to figure out what your compensation should be. You need to be proactive with your compensation. If you are unable to make enough to pay yourself, you have great motivation to improve your practice’s financial affairs. Ownership interests: Dr. Jones, 55 percent; Dr. Jonah, 25 percent; Dr. Rice, 20 percent. 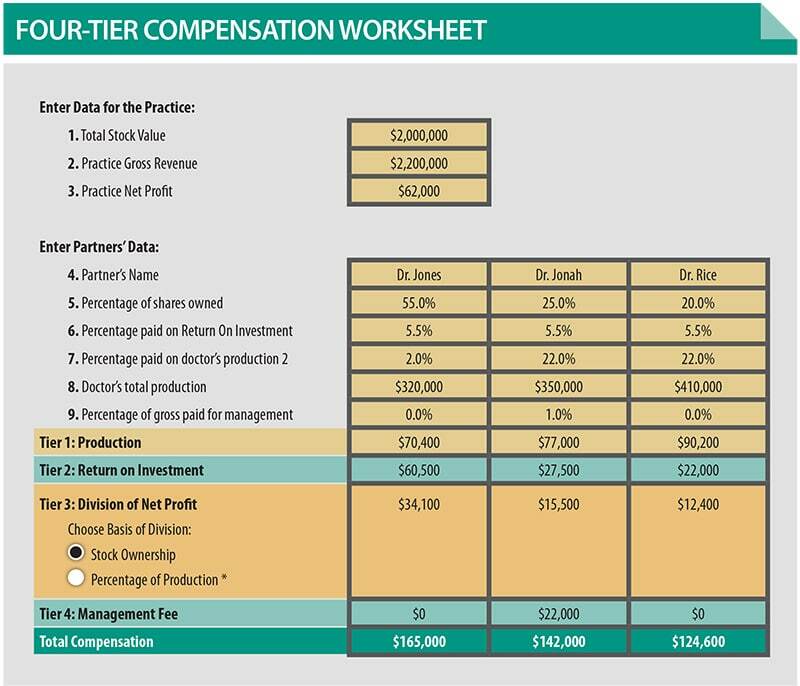 As you can see in the worksheet below, all partners are paid fairly based on the time and effort they put into the practice and their percentage of ownership. An owner can work two or three days a week, be semiretired and still be paid fairly, or the owner can work full time and be paid fairly as well. If an owner is active in management of the practice, he or she can be compensated for those activities. As an aside, in states where non-DVMs can own a veterinary practice or a percentage of it, the formula could be used to compensate the non-DVM owner. Obviously, there will not be any production by this person, or related compensation, but the non-DVM owner would still receive a return on investment and a division of net profit, and his or her salary would be management compensation, or he or she could get a percentage of the gross revenue as management compensation. This is a great way for non-DVMs to buy into a practice and receive fair compensation. Regardless of whether you are the sole owner, are in a partnership or are a non-DVM owner, you need to be paid fairly for your time, activity and ownership interest. This compensation should not be arbitrary, and you should not be paid based on what is left in the checkbook at the end of the month. To know if your veterinary practice is truly financially healthy and to ensure that you, the owner, get paid what you deserve, be proactive and utilize the four-tier compensation formula.